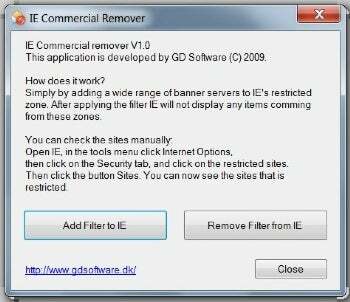 IE Commercial Remover (free) is a simple app that requires no installation. Running it and clicking a button adds seven Web sites (one of which has an asterisk, representing all sites at that domain) to its restricted list. This has the effect of removing numerous banner ads and popups from displaying, as these sites furnish a good portion of the Internet's ads. Unfortunately, it's not a big enough percentage. Just a single click in IE Commercial Remover will add several sites to IE’s restricted list.